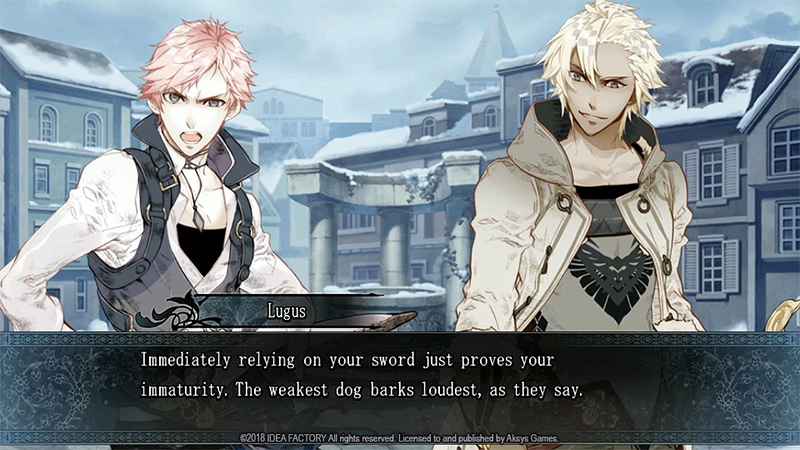 In this second edition of the column we take a look at the final title in Aksys Games’ “Summer of Mystery” trilogy — Psychedelica of the Ashen Hawk. 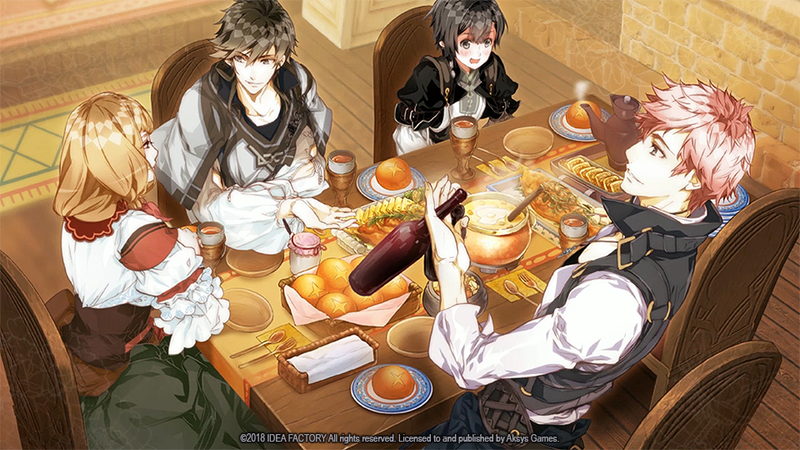 After previously covering the first two games in Aksys Games’ “Summer of Mystery” batch of otome releases — Psychedelica of the Black Butterfly and 7’scarlet — in the debut edition of Adventure Corner, it’s time to look at the final game. 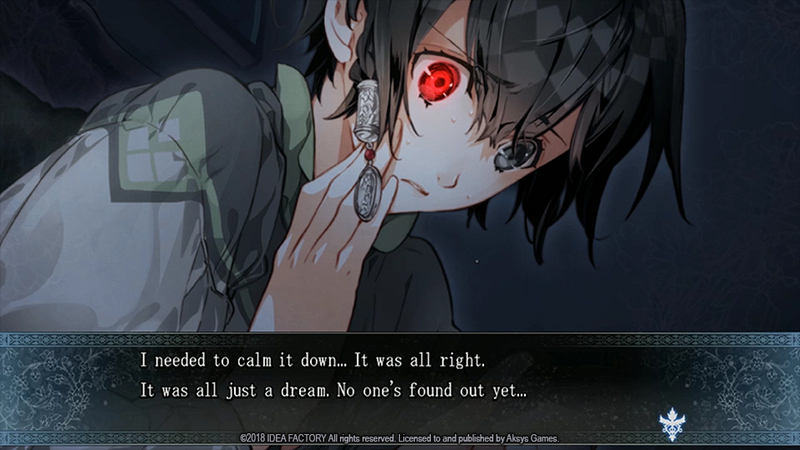 As its title suggests, Psychedelica of the Ashen Hawk is connected to the first of those titles, even if the connections are only confirmed later in the game. Otomate dialled back a bit from the more experimental nature of Black Butterfly, as many of its less common elements — which perhaps didn’t work as well as intended — are removed or altered. This seemingly results in Ashen Hawk becoming a bit more straightforward as it rests more on the primary narrative, but the game is the better for it. Ashen Hawk puts players in the role of Jed, a young woman living in a small Middle Age gothic town. However, Jed spends her time disguised and acting as a male in order to hide the fact that she is a supposed witch, a status signified by her right eye glowing red when she experiences great emotion. She lives just outside of the town itself in a large tower shared by a lazy and carefree man known as the Ashen Hawk, one of only two people who know about Jed’s nature prior to the game’s events. The other is Francisca, the head of the Wolf clan, one of two families that run the town, who acts as a mother figure to Jed. Though she grew up with the Wolf Clan, Jed herself manages to maintain a generally neutral position, working as a handyman for all those who need assistance in various tasks. Though the chapter structure and flowchart from Black Butterfly return, Ashen Hawk is much more linear in nature. It is much more of a route vine than a route tree, as most of the endings follow immediately after stepping off of the main branch. At the heart of most of the game is the conflict between the Wolf Clan and the Hawk Clan, as the two groups frequently come close to blows. Jed aims to help smooth these over and is given the task of finding an important item known as the Kaleido-Via prior to a festival called the Masquerade. The centrepiece of the festival, the Kaleido-Via’s presence is enough to remind the two clans of a peaceful prior coexistence and bring that back to the town. 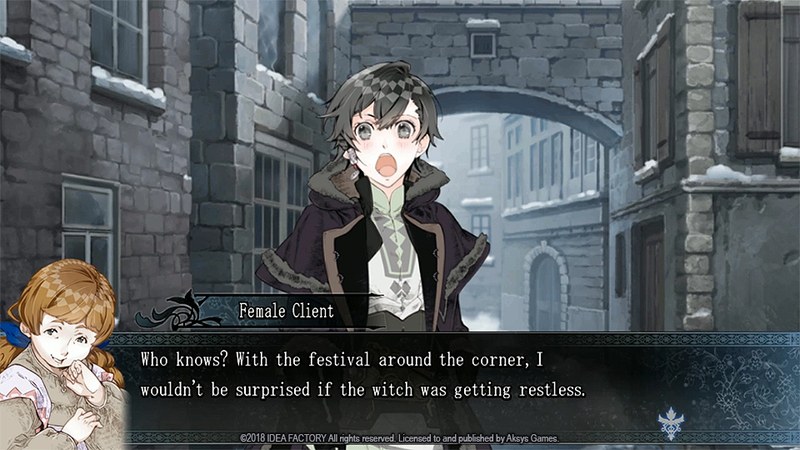 Jed’s investigations are showcased in the game by sections where she chooses various places to go around town, thankfully replacing the annoying shooting mini-game from Black Butterfly, where she gives quick interviews with various townsfolk and takes part in various additional side events that both help build up and add depth to the town and its characters. The second half, meanwhile, focuses on the more supernatural elements of the game, many of which are hinted at in its first half, and it’s here that the connections to Black Butterfly become more apparent and indeed outright stated. Ashen Hawk is far less focused on the romantic side of things than many other otomes, and really the majority of endings are very hard to describe as happy ones; even the earliest attainable ones — both actually labelled as “happy” — become much less so in the hindsight of later reveals. Nevertheless, this works well and witnessing some of these less desirable endings helps build the intrigue and ends up providing more impetus, appreciation, and satisfaction for reaching what is regarded as the true end. Jed is thankfully one of the stronger otome heroines out there, never falling into the trap of just being a bystander to events and her actions drive the plot forward, though it takes a while to get up speed. The rest of the cast is also strong. Though amnesia plays a key part in many of the reveals leading into most of the endings, it’s only a defining characteristic on one particular cast member, and even in that case it’s effectively used. The primary cast maintains plenty of backstory and history with each other, which make their interactions throughout engaging. The few criticisms to be made are that it takes a bit too long for the story to get fully involved — particularly as there are no real decisions on the player’s part during almost the entire first half — and that it can be a bit hard to follow certain threads and the connections to Black Butterfly. The connections do make it fairly necessary, though not vital, to have played through the true route of the weaker predecessor to fully appreciate everything that happens in the second half. Nevertheless, the narrative threads all end up coming together in a very satisfying way, with some curious aspects of the setting — which players may pick up upon fairly early — playing interesting parts in that. Though it takes a while to get fully going, in the end Psychedlica of the Ashen Hawk is a highly successful and worthwhile mystery tale.